The history of Rojo mixers dates back to Sweden and to the early 1940´s. 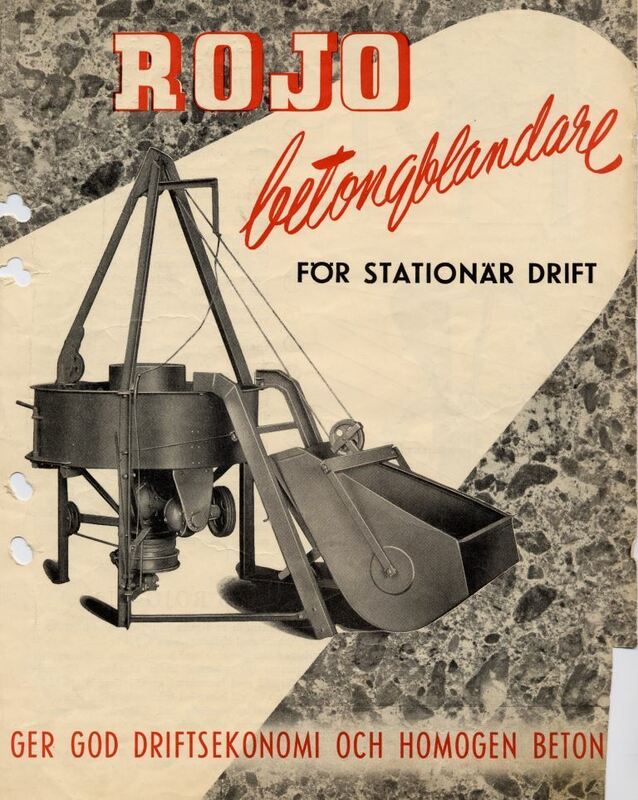 The Rojo mixer was invented by the company AB Byggförbättring in Stockholm. The company was run by the Engineer and Inventor Emrik Lindman. The first models where simply called Rojo 1, 2 and 3 according to size and mixing capacity. The name ROJO comes apparently from the first two letters of the name of the mixer designer Roland Johansson (RoJo). Rojo mixer models quickly became very popular because the design was simple yet very durable and needed minimal maintenance. The mixers where equipped with wearing plates from the beginning, which was revolutionary at the times. Many mixer parts was interchangeable between the models so the number of different parts needed to build the different models was kept minimal. Thousands of mixers where sold to the concrete industry in Sweden between the 1940´s and the 1970´s. A few dozen where also exported to Europe and The Far East. The mixer manufacturing business was sold by AB Byggförbättring to Rojomaskiner AB in 1979. Rojomaskiner AB was run by Arne Anderssén and his son. They manufactured and sold mixers to the construction industry and started to develop special models for mixing refractory concretes. Rojomaskiner AB was bought by Refrak Oy in 2004. We named our new business unit Rojo Machines Finland and moved the manufacturing of mixers to the city of Kotka in Finland. 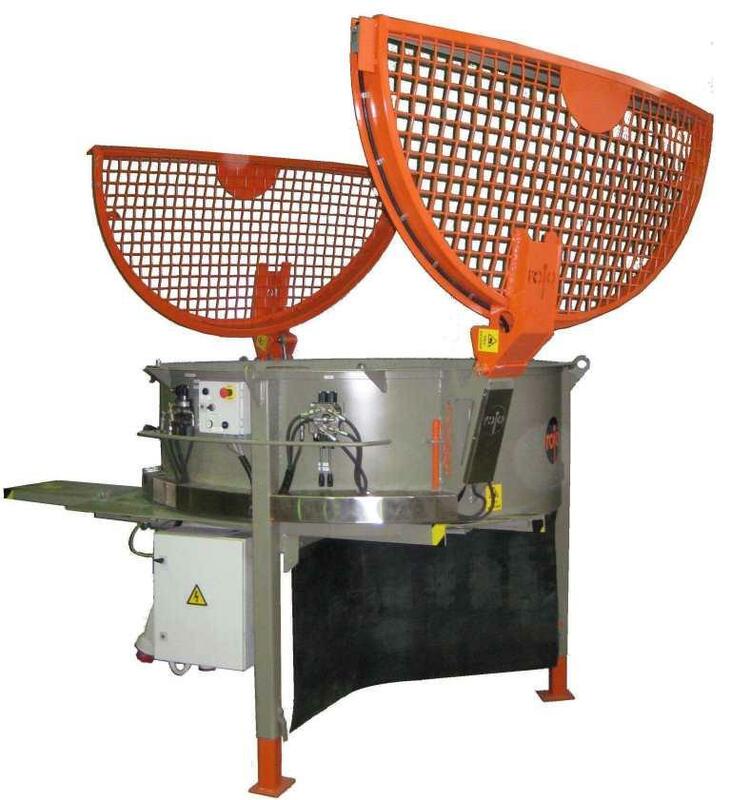 We have further developed the mixer models and invented new ones that meet the needs of our customers worldwide. We strive to make the best mixers in the world but also respect the quality standards set by the inventors and builders of Rojo mixers in the past. Rojo 1000 LC with a hydraulically operated slide-gate discharge and lid. The mixer is also equipped with a frequency converter for mixing speed adjustment. We are an innovative company and our main focus is giving the best possible service to our customers as quickly as possible. Construction projects today are done under strict time schedules and don’t allow for downtime because of broken down machines or long waiting time for spare parts. We keep spare parts for all our mixer models including older models and new mixers ready for shipment always in stock. We constantly try to improve our customer service and really listen to customer feedback and ideas. The demand for tailored solutions has led us to develop new products such as silos with screw conveyors, material feeding systems, material batching systems, automatic water feeding and much more.